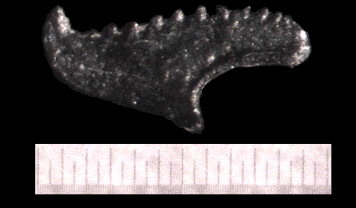 Collected: Removed from Waldron Shale in Nashville, Tennessee, USA, from Ordovician deposits. Estimated Age: about 450 million years old. Comments: Mosaic stereo pictures. Specimen was sandwitched between layers of dark, fissil shale. Specimen is 1.05 mm in length. "Scoleceodonts are similar to conodonts in many ways: they form multielement feeding apparatuses which generally become disarticulated on death and decay, with no trace of the rest of the body. However, there the similarity ends. Scolecodonts are the "jaws" of polychaete annelids and are closely comparable to the jaws present in some living polychaetes. They look superficially like conodonts because they perform similar functions, but they are made of a complex mixture of collagen fibres and various hardening minerals such as zinc (not chitin as commonly thought)." -- informal communication, Dr. Mark Purnell, University of Leicester, May 1997.